This week’s item at Supermarket is a treasure trove of sparkling gems, perfect for a pirate’s lass in need of something fresh for Summer. A heavyweight sterling silver nautical link bracelet, laden with six different rock crystal charms including a salty looking piece of druzy, is an absolute steal at only $77.00. The Treasure Charm Bracelet is on sale for one week only, starting today. Check back next Monday for a new Freshly Picked item! I say show off your big rocks, especially if they are chunky and perhaps a bit unrefined. An oversized organic looking charm bracelet is just the right statement, particularly with this summer’s favorite silhouette, the maxi dress. I am currently loving this one by Christopher Deane, in a sheer cotton silk nautical print with twisted rope straps that criss-cross in the back. It happens to be on sale through July 7th, at Sophia Eugene, so run don’t walk before they get sold out! 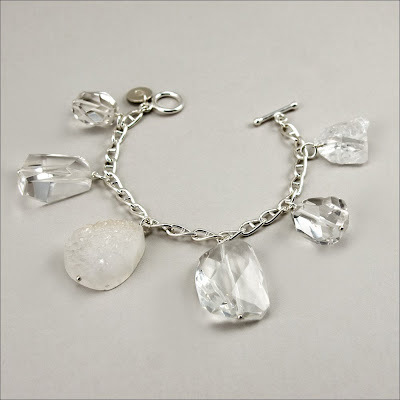 Cynthia Rybakoff sterling silver and rock crystal Treasure Charm Bracelet, from the Post Bling Collection, $77.00 this week only at Supermarket. Here's another vintage ad, this one for Ralph Lauren Purple Label featuring Goop's Gwyneth Paltrow, who wore a lot of classic RL in those days (remember the stunning pink Oscar dress?). A mini Gwyneth, snapped at an event and trapped in a rather boring collage, with lovely Maggie Rizer, wears a freshwater micro-pearl choker I designed for Spring 1998. New minted RL VIP Candy Pratts Price took umbrage with the Collection jewelry that season, as she felt the look should be gumball size faux pearls. That being said, Ralph went with the real thing. Those Carolee pearls would never do! Spotted on NOTCOUTURE, my daily inspiration and fashion filter for all things luxurious and indulgent! Say hello to this week’s Freshly Picked item, new at Supermarket. 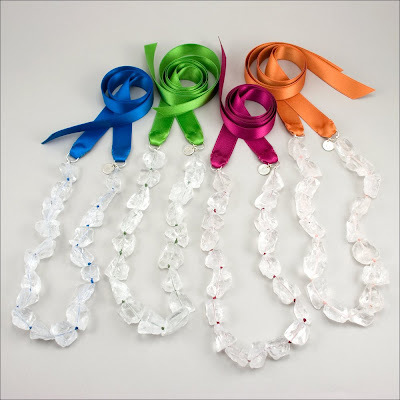 Starting today, Rock Candy Ribbon Necklaces are 30% off for one week only. Sweet as sugar and 100% organic, rough crystal in its natural state bears a striking resemblance to that childhood favorite, rock candy! I used to buy mine on a wooden stick at the Amagansett Farmer’s Market, back in the 70’s. The rough, unpolished stones look really cool, like wearing ice on a hot summer day! Pick from four super-bright colors, and get ‘em while they’re in season. Check back each Monday for more freshly picked items! 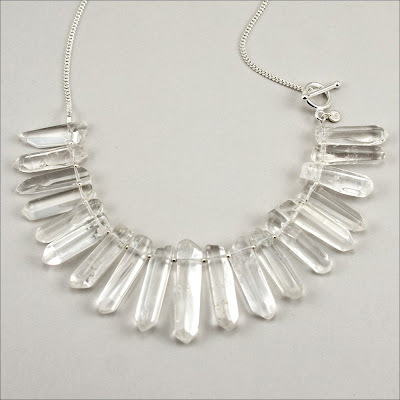 Cynthia Rybakoff sterling silver and rough rock crystal Rock Candy Ribbon Necklaces from the Post Bling Collection, $48.00, this week only at Supermarket. The other day I was showing a friend some vintage media featuring my jewelry, and this ad practically leapt off the page of my chocolate leather portfolio. "Oooh, Janice Dickinson!" my friend squealed (she would never have recognized the diva, were she not currently a reality TV star). There she was, looking exceptionally young, gorgeous and natural, sitting for Richard Avedon in 1989. Stylist Julie Britt, who hired me to design jewelry for Revlon's "The most unforgettable women in the world" campaign, was a creative dynamo, custom making everything, like those sculptural organza collars (I still have the fabric she gave me for inspiration). The pave rhinestone jewelry was originally designed for Isaac Mizrahi's first runway show, but lots of stylists and editors were requesting it for shoots, including Sarajane Hoare at British Vogue. Julie decided just one earring was enough, but make it longer! I was invited to the shoot at Avedon's Upper East Side studio and remember meeting him briefly. The models were quite ethereal, having their make-up done. Not much conversation there. Truthfully, I was just delivering props for the set, so off I went back to my own studio slash bedroom, not quite ever believing I was really there. Introducing Freshly Picked, a new weekly shopping event at Supermarket. Every Monday I’ll be featuring a brand new gemstone item at a very special price, for one week only. Get ‘em while they're in season and check back each week for more freshly picked items! 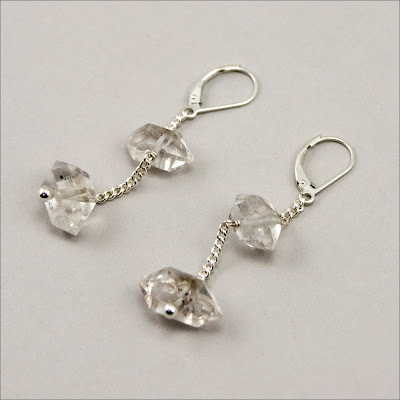 Starting today, Herkimer Diamond Drops are 30% off. A unique variety of double-terminated quartz crystals found mainly in upstate New York’s Herkimer County, Herkimer Diamonds have a natural diamond-like geometric shape and are believed to be close to five hundred million years old. I recently fell in love with these magnificent works of nature, and like them best in their natural rough form. Get these beauties while supplies last for only $36.00. Locally hand crafted in NYC, fresh gemstones in season, on sale this week only at Cynthia Rybakoff. 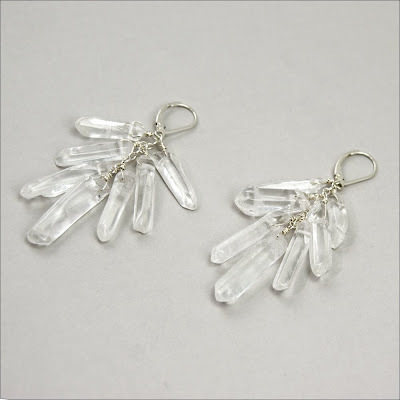 Cynthia Rybakoff sterling silver and rock crystal Herkimer Diamond Drops from the Post Bling Collection, $36.00, this week only at Supermarket. We all know that behind every Superman is a Superwoman. Clark, we appreciate your penchant for red and blue, but what about some rocks for her? What would make a strong statement? You definitely need to avoid green. Maybe something organic and futuristic looking in a crystal spike formation? Cynthia Rybakoff sterling silver and rock crystal Fortress Of Solitude necklace, $74.00 and earrings, $38.00, from the Post Bling Collection at Supermarket. 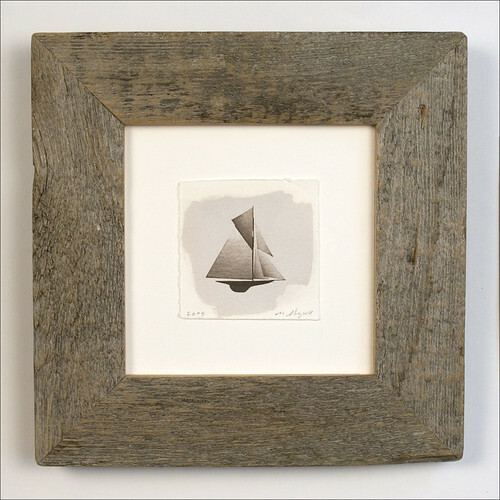 Announcing Handmade On Peconic Bay limited edition Cyanotye and Van Dyke Brown prints, by Matt Shapoff, at Mascot Studio, a jewel box of a gallery located in Manhattan's East Village. Proprietor and artist, Peter McCaffrey hand picks eye catching art and objects for his impeccably styled shop, with a decidedly cabinet of curiosities aesthetic, and will also whip up the perfect custom frame for your own artwork. An influential resource for fine art and decorative objects since 1982, Mascot studio is really the prototype for the kind of design made popoular today by West Elm and other mass market retailers. 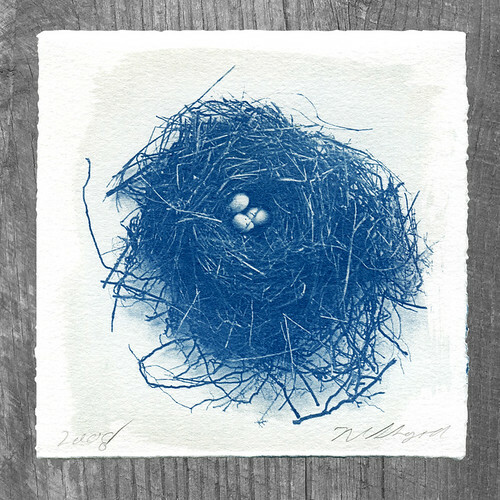 Handmade On Peconic Bay Cyanotype and Van Dyke Brown prints $25-$145, at Mascot Studio 328 East 9th Street, NYC, 212-228-9090. It’s been a problem, telling folks where they can find me online. I am based at 8 sites I actively use and update. LOOK at my portfolio site, Cynthia Rybakoff, where items are mostly available by inquiry. SHOP at my boutique at Supermarket, showcasing my newest jewelry and gift items. READ my blog if you love jewelry. FOLLOW me on Twitter, where inspiration is instantaneous. 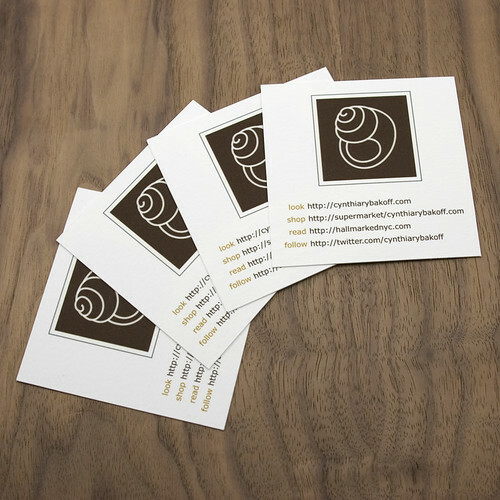 My new web card is a neat solution to the inconvenience of having to awkwardly write out all this information on the back of my business card, so proper in it’s 3.5 x 2 format delineating name, title, address, phone/fax and email with nary a pixel of space for Web 2.0! What URL's didn’t make the cut? My husband Matt Shapoff’s Handmade On Peconic Bay shops on Etsy and Supermarket, where you can COLLECT affordable indie art by a rising talent. My Facebook group, which anyone can JOIN for news, product updates and invitations to sale events (my sample sales are a huge bargain, if you know when and where!) and Flickr, where you can PERUSE the flotsam and jetsam of my career in tidy photo gallery format.